Also serving communities of Schnecksville. There are 28 Assisted Living Facilities in the Northampton area, with 2 in Northampton and 26 nearby. To help you with your search, browse the 159 reviews below for assisted living facilities in Northampton. On average, consumers rate assisted living in Northampton 3.5 out of 5 stars. Better rated regions include Allentown with an average rating of 4.0 out of 5 stars. Caring.com has helped thousands of families find high-quality senior care. To speak with one of our Family Advisors about assisted living options and costs in Northampton, call (855) 863-8283. Located just 15 miles from Allentown in Lehigh Valley, the borough of Northampton, Pa., features amenities for seniors that include two assisted living facilities and another 45 located in close proximity. Northampton’s assisted living facilities, also referred to as personal care homes, are licensed by the Pennsylvania Department of Human Services. These facilities are designed to provide assistance to seniors with tasks and activities associated with daily living. There are some facilities in the area that also provide more specialized medical care for seniors with conditions such as dementia. Northampton has an array of resources for seniors, including the Northampton Senior Citizen Center, which offers health screenings, classes, activities and meals. Transportation is offered to Northampton seniors to attend. The Northampton area is home to world-class medical facilities, including the Northampton Medical Associates, in the event of medical emergencies or illness. The Lehigh and Northampton Transportation Authority bus service provides public transportation for Northampton. Seniors aged 65 and over ride the bus for free anytime. The state of Pennsylvania does not tax social security checks as some states do. This can leave more money in seniors’ budgets for care at an assisted living facility. In addition, the state does not generally tax seniors’ withdrawals from 401k accounts or work retirement accounts. The cost of living index in Northampton at 118 is more expensive than the national average cost of living index which is 100. This, too, may impact seniors’ budgets. Northampton weather can be difficult for seniors, especially in winters when the average January temperature dips to a low of 19 degrees and heavy snowfalls are common. Seniors with respiratory problems may find the area’s hot and humid summers difficult, too. Assisted Living costs in Northampton start around $0 per month on average, while the nationwide average cost of assisted living is $4,000 per month, according to the latest figures from Genworth’s Cost of Care Survey. It’s important to note that assisted living rates in Northampton and the surrounding suburbs can vary widely based on factors such as location, the level of care needed, apartment size and the types of amenities offered at each community. 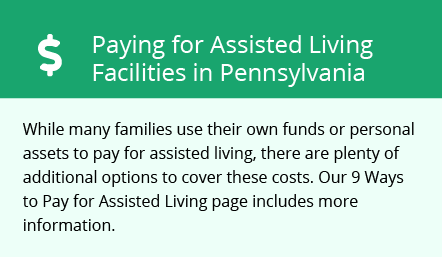 The state of Pennsylvania does not offer financial assistance for seniors who require care at an assisted living facility. The only waivers offered in the state provide assistance for seniors who require nursing home care or who want to reside at home but require some support. However, eligible seniors receiving SSI benefits can qualify for the state to pay a supplement for care at an assisted living facility. Often, there is a waiting list to receive this type of benefit. Northampton and the surrounding area are home to numerous government agencies and non-profit organizations offering help for seniors searching for or currently residing in an assisted living community. These organizations can also provide assistance in a number of other eldercare services such as geriatric care management, elder law advice, estate planning, finding home care and health and wellness programs. To see a list of free assisted living resources in Northampton, please visit our Assisted Living in Pennsylvania page. Northampton-area assisted living communities must adhere to the comprehensive set of state laws and regulations that all assisted living communities in Pennsylvania are required to follow. Visit our Assisted Living in Pennsylvania page for more information about these laws.